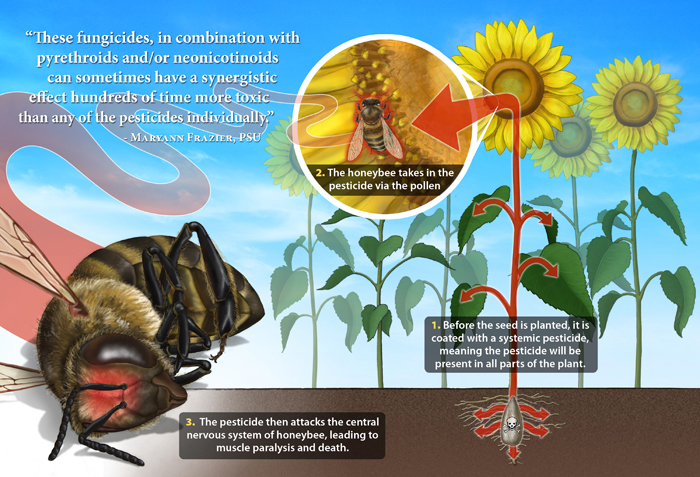 Neonicotinoids, also called neonics, are the world’s most widely used insecticides. There is mounting evidence that they are harmful to honeybees at the levels found in fields, although few studies have established that neonics harm the overall performance of colonies. Specifically, the recently uncovered studies looked at the impact of Bayer’s clothianidin and Syngenta’s thiamethoxam on honeybees at varying concentrations. The tests show that, at high concentrations, both products can seriously harm bees. The effects were less pronounced at lower levels, concentrations of 50 parts per billion (ppb) and 40 ppb, respectively. “Bayer and Syngenta’s commitment to pollinator health should include publishing these data or otherwise making them public. Both Bayer and Syngenta had assured regulators and the public that clothianidin and thiamethoxam did not pose a significant risk to honeybees. “Given all the debate about this subject, it is hard to see why the companies don’t make these kinds of studies available. “The study conducted in North Carolina is an artificial feeding study that intentionally exaggerates the exposure potential because it is designed to calculate a “no-effect” concentration for clothianidin. Although the colony was artificially provided with a spiked sugar solution, the bees were allowed to forage freely in the environment, so there is less stress (which can be a contributing variable) than if they were completely confined to cages. This protocol was developed jointly by Bayer and the EPA several years ago and it is now being applied to other compounds. Based on these results, we believe the data support the establishment of a no-effect concentration of 20 ppb for clothianidin, which is consistent to that of other neonicotinoids. “The EPA asked us to do this study and agreed [to] the methodology. A sucrose based mechanism was used on the basis that it was required to expose bees artificially to Thiamethoxam to determine what actual level of residue would exert a toxic effect. There were transient effects observed and the reported No Adverse Effect Level (NOAEL) for this study was 50 ppb (parts per billion). It is accepted that residues of Thiamethoxam in pollen and nectar from seed treated crops are in the single ppb level. So this reported NOAEL of 50 ppb indicates that honeybee colonies are at low risk from exposure to Thiamethoxam in pollen and nectar of seed treated crops. Those who are familiar with the pesticides implicated in the research were not shocked by the buried findings. Plenty of other studies have already demonstrated just how toxic neonicotinoids are to honeybees. A risk assessment conducted by the EPA revealed this past April that imidacloprid – a neonic widely sprayed on grains, vegetables, fruit, and other crops in the U.S. – posed a serious risk to honeybees and hives when sprayed on certain crops. Last month, a study published in the journal Nature linked the long-term decline of wild bees in England to the use of neonicotinoids. Last year, a major field study in Sweden revealed that exposure to fields treated with clothianidin severely impacted wild bees. Honeybees fared slightly better. The products are pervasive, making them hard for bees – or any living creature, for that matter – to avoid. Harvard researchers said last September that they’d found neonicotinoids in 70% of honey samples they analyzed. The bee-killing chemicals were also discovered in 50% of rivers and streams tested by the U.S. Geological Survey. Neonicotinoids have been blamed for the destruction of 600 hives containing 37 million honeybees in Canada. In response to these damning studies and massive die-offs, some states and cities have banned neonicotinoids. Maryland became the first U.S. state to do so. Boulder City, Colorado, nixed the use of the chemicals in 2015, as did the city of Portland, Oregon.